OK, so here's the thing! - When I was first invited a few weeks ago by OMY to be a member of the media 'Star Bloggers' team to take part in the AsiaOne Adventure Race 3 which happens this Saturday, my mind - which often works in very mysterious ways - did some very strange things indeed. Immediately, my hidden desire to one day participate in the popular TV reality show, The Amazing Race (or The Amazing Race Asia) boiled to the surface. Soon after, I started having flashbacks of the most recent instalment of the blockbuster movies, 'The Fast and the Furious'... However, instead of seeing myself on the streets of Japan 'drifting' around sweeping bends, burning rubber while chucking doughnuts and using the handbrake for some radical manoeuvres, my mind was running 100mph trying to consider how I could emulate these skills on the streets of Singapore (without getting myself - or my team - arrested). Obviously, there was absolutely no hesitation in my acceptance to participate in this inaugural event. "Form a team of four and pit your team against 91.3 DJs Jeremy Ratnam and Adam on June 11 in sponsored cars. Sort out the clues and complete the challenges in a treasure hunt that calls for your brains, brawn and beauty." Let me emphasise - Brains... Brawn... Beauty... well luckily for me, my fellow team members and OMY Star Bloggers have got my back on these critical factors. As a media representative team, we are not in the running for the very attractive prize pool, but we are definitely in the running to secure 'bragging rights'. You should know by now, that most Aussies are very passionate about their sports and usually extremely competitive!! I am no exception. The OMY Star Bloggers team, are made up of the Crazy Ang Moh (that would be me), the Photographer, the Traveller and the self-proclaimed 'Cam-Whore'. WTH - you may rightly ask... but the way we figure it, we have such a diverse mix of skills we are bringing to the table that we will definitely be a challenge to be reckoned with. We expect to remove the prefix 'Dys' completely and end up with a fully 'Functional' team. Before you get too nervous and think that you better stay in on Saturday and tell all of your loved ones to stay clear of the roads, on Tuesday night this week, we attended a pre-race briefing, and my 'Fast and furious' delusions were rapidly shot down. Of course, no event organizers are going to give out sponsored cars to a bunch of ill-bred street racers. It was made quite clear (along with a number of other regulations), that the first rule is to 'follow the rules' - the race winner is not determined by the team who arrives at their final destination first. Success on the day, will be measured by a points scoring mechanism as awarded at each of the checkpoints or activities (I think my team can all breathe a sigh of relief). We were also given two mobile devices by Singtel which will be used in the day, and the kind team from there gave us instructions on how to download and use Apps on these Android devices. Jerome and Eunice have taken them home to charge and familiarize themselves with the technology. We also received a Nikon camera on which Eunice was fully trained on at the briefing. 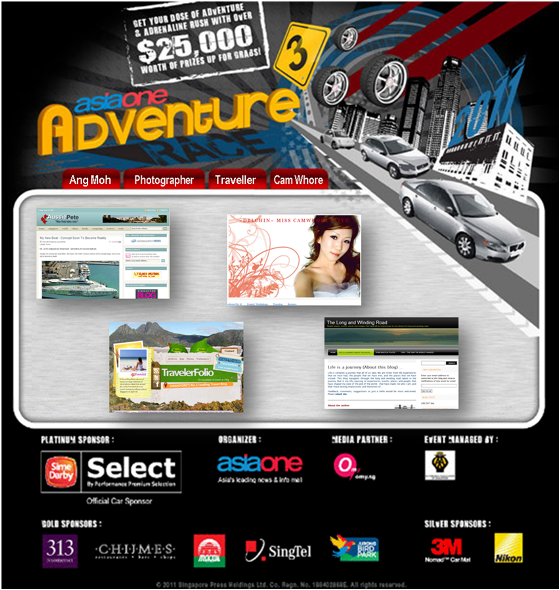 The vehicles will be provided by Sime Darby Select, who are the official car sponsors. The other participants all drew out of a 'lucky' draw for their car selection - the OMY Star Bloggers and the 91.3 DJ team had already been allocated a vehicle. Ours is a Volvo XC60 T6! I have not driven a Volvo in my life, so after a quick Google search I found our car - pretty neat huh? I'm not sure if ours will be red, but below is a mock-up with some OMY and star bloggers branding... if you see a car resembling this cruising the streets of Singapore this Saturday, be sure to wave and holler at us! !